Arsenal manager Arsene Wenger has said about his former striker Thierry Henry that he has the qualities to become a manager in future. Arsenal manager Arsene Wenger has said about his former striker Thierry Henry that he has enough qualities to become a manager in future. Thierry Henry who announced his retirement from professional football yesterday has joined the pundit’s board at SkySports. But the Arsenal all-time top scorer has already expressed his desire that managing Arsenal would be like a dream come true. The 37-year-old former Barcelona striker is tipped by his former boss Arsene Wenger that he can become Wenger’s successor. Henry started his football at Monaco where he played five seasons before moving to Juventus. He spent only a season in Turin and then was spotted by Arsene Wenger who brought him to Arsenal in 1999. 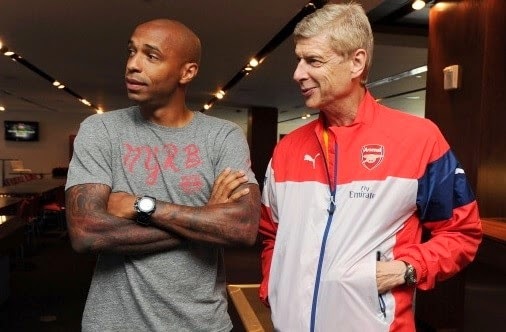 Wenger believes that Henry has a heart attached to the Gunners and he will definitely return to Emirates. "He always showed an incredible insight in his judgement of players. He has a real ability to unearth talent." Henry scored 228 goals for Arsenal in eight seasons before moving to Spanish giants Barcelona in 2007 where he 49 goals in 121 appearances. Arsenal legend who returned on a loan spell in January 2012 has a statue for his contribution outside the Emirates stadium. Wenger added when he was asked about Henry's character: "Thierry is blessed with a strong personality and he could get angry, but once he had re-found his calm, he was always very clear-headed. Henry is a cool minded person he is calmed 90% but sometimes he does get angry, according to Wenger.